I recently read two books while up north. It was during the last spring snow storm, and I was not going out into it. So, I settled into a comfortable chair in front of the fire and enjoyed my favorite pastime…reading. The Mourning Hours by Paula Treick DeBoard was a story I could not put down. It takes place in rural Wisconsin. Most of us will be able to relate to the peaceful farm scenes described. In this tranquil setting tragedy struck or was it murder? A young teenage girl goes missing in a snow storm. Family’s lives are forever altered; a community is torn apart. Nine years later the past is revisited and the terrible truth about the missing girl is revealed. The story is so well written. You will share the emotions of the characters in the story. You will feel their joy of life, their anguish of loss and the fear that someone you love may have committed a terrible crime. Be prepared for a sleepless night. You will have to stay up late to finish this one. 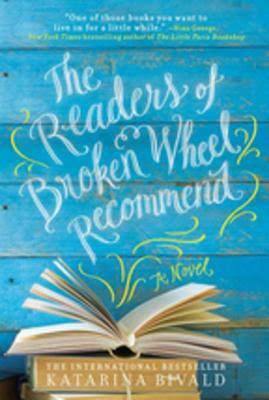 From this suspenseful read I made a one hundred an eighty degree turn and found this delightful book, The Readers of Broken Wheel Recommend by Katarina Bivald. It had me right from the start. It is a story of a friendship based on a mutual love of books. The friends are of different generations and from different countries, who exchange l etters and their favorite books. You will be drawn into their unique relationship. The main character, Sara, is from Sweden, and she soon finds herself in Broken Wheel Iowa eager to meet her pen pal Amy. Life happens when you are making other plans and that is clearly the case in this story. The people of Broken Wheel will make you laugh and cry. By the time you turn the last page you will be ready to move to Iowa and will want Sara to find just the right book for you. If you love books; you will be charmed by this one. The moral of this story is there truly is a book for everyone.